the calcium salt of pantothenic acid; a vitamin B filtrate factor. A salt of pantothenic acid, commonly used in vitamin supplements. Biochemically, it transfers acetyl groups from one compound to another. Egg yolks, liver, and yeasts are nutritional sources. a chemical element, atomic number 20, atomic weight 40.08, symbol Ca. See Table 6. Calcium is the most abundant mineral in the body. In combination with phosphorus it forms calcium phosphate, the dense, hard material of the bones and teeth. It is an important cation in intra- and extracellular fluid and is essential to the normal clotting of blood, the maintenance of a normal heartbeat, and the initiation of neuromuscular and metabolic activities. Within the body fluids calcium exists in three forms. Protein-bound calcium accounts for about 47% of the calcium in plasma; most of it in this form is bound to albumin. Another 47% of plasma calcium is ionized. About 6% is complexed with phosphate, citrate and other anions. Ionized calcium is physiologically active. One of its most important physiological functions is control of the permeability of cell membranes. 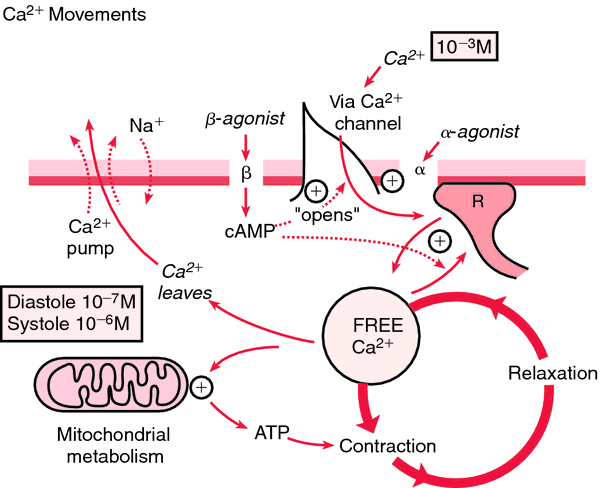 Parathyroid hormone, which causes transfer of exchangeable calcium from bone into the bloodstream, and calcitriol maintain calcium homeostasis by preventing either calcium deficit or excess. used extensively as a spray in orchards, constituting a poison hazard for livestock. excess calcium in the avian diet, especially in diets low in phosphorus causes nephrosis, visceral gout and urolithiasis. the balance between calcium intake and losses in feces and urine. an insoluble salt occurring naturally in bone, shells and chalk. A common form of supplementary calcium in dogs and cats on meat-based diets, used because of its high concentration of calcium (40%) and absence of phosphorus. an intravenous infusion of calcium will cause increased levels of gastrin in dogs with a gastrinoma. Often used in combination with a secretin test. a salt used in solution to restore electrolyte balance, to treat hypocalcemia and as an antidote to magnesium poisoning. Is highly irritant and has been discarded generally in favor of less irritating substances, e.g. calcium borogluconate. agricultural fertilizer capable of being toxic. calcium ethylenediamine tetra-acetic acid; the disodium and dipotassium salts are commonly used as anticoagulants in the preservation of blood samples for hematology. A chelating agent, used parenterally in the treatment of lead poisoning. See also edetate. in all species may cause hypercalcitonism with decreased osteoclastic activity and skeletal remodeling. In dogs, disorders of enchondral ossification with curved radius and osteochondrosis have been demonstrated; secondary iron deficiency anemia occurs in piglets. naturally occurring mineral. Called also fluorspar, fluorite. contains high levels of calcium; given to cows as a drench or in the feed as a prophylaxis against milk fever. a calcium replenisher and antidote to fluoride or oxalate poisoning. maintenance of normal calcium metabolism by the combined effects of adequate alimentary intake, renal excretion, parathyroid hormone involvement, 1,25 dihydroxycholecalciferol (or calcitriol) and calcitonin, plasma protein binding and deposition in tissues. an astringent compound used topically in solution or lotions; in dentistry used to encourage deposition of secondary dentine. Called also slaked lime. In solution, called lime water. thought to be inherited as an autosomal dominant trait in Great Danes commencing in puppies about 5 weeks old, characterized by incoordination with deformity and displacement of the 7th cervical vertebra and mineral deposits in the intervertebral joints, in serous and synovial membranes and mineralization in most other tissues. used for supplementing the diet with calcium; contains 18% calcium. As calcium sodium lactate, containing 8% calcium, it is more soluble and can be used in drinking water. a calcium compound used parenterally in the treatment of hypocalcemia; contains 14.8% calcium. administered orally and used as a urinary antiseptic. used as an additive during cheese making to control fermentation. Whey from this cheese may cause nitrate poisoning in pigs. protein-bound fractions of plasma calcium. nutritional deficiency of calcium is rarely primary except in carnivores on an all-meat diet. Secondary deficiency is usually the result of diets having too high a content of phosphorus. The outcome of either deficiency may be nutritional hyperparathyroidism, rickets, osteomalacia, osteodystrophy in horse and pigs, and degenerative arthropathy of cattle, depending on the species, age of the animal and availability of vitamin D. Hypocalcemia may not occur because of the activity of parathyroid hormone, but classical tetany and recumbency can occur if the deficiency is prolonged or if they are precipitated by some other factor. a compound occurring in the urine in crystals and in certain calculi. See also oxalate urolith. alkaline and capable of causing gastroenteritis. There is a high concentration in basic slag and this may contribute to that poisoning. a calcium salt of the dextrorotatory isomer of pantothenic acid; used as a growth-promoting vitamin. one of three salts containing calcium and the phosphate radical: dibasic and tribasic calcium phosphate are used as sources of calcium; monobasic calcium phosphate is used in fertilizer and as a calcium and phosphorus supplement. An important constituent of uroliths. the ratio of calcium to phosphorus in the diet, 1 : 1 to 1 : 2 is usually considered to be adequate for proper calcium nutritional status in most animal species. Diets outside this range are likely to cause osteodystrophies. Animals grazing phosphorus-deficient pasture, and those being intensively fed on grain rations which have an abnormally high phosphorus content, are the principal subjects. Horses on heavy grain diets and dogs and cats on meat diets without calcium supplementation are also targets for the disease. a hydrophilic agent used as a bulk laxative in the treatment of constipation and diarrhea. biologically inert fraction of plasma calcium; most is bound to albumin and globulins with a small fraction complexed to organic and inorganic acids. crystals of this mineral are thought to contribute physically to the gastroenteritis caused by basic slag poisoning. the main component of plaster of Paris; also used as a dietary source of calcium and inorganic sulfate sulfur. include calcium carbonate, gluconate, lactate and phosphate; bone flour, bone meal, ground limestone, chalk. cards coated with calcium tungstate crystals are used to sandwich film in a light-tight cassette. They fluoresce when exposed to x-rays and, together with the beam, affect the film emulsion. They reduce the exposure factor required. Brzezinska-Wcislo L: Evaluation of vitamin B6 and calcium pantothenate effectiveness on hair growth from clinical and trichographic aspects for treatment of diffuse alopecia in women. has the disadvantage of having a very narrow portfolio of products and consequently their profitability is largely dependent on the market price of D Calcium Pantothenate. 5 Mcg Vitamin E 51U Vitamin C 25 Mg Vitamin B3 15 Mg Folic Acid 50 Mcg Calcium Pantothenate 1 Mg Elemental Calcium 75 Mg Elemental Phosphoras 58 Mg Copper Sulphate 50 Mcg Magnese Sulphate 0. Research: Investigators initiated a double-blind, randomized, parallel-group, placebo-controlled study in order to evaluate the effect of orally self-administered Slim339, which is a proprietary fixed combination of Garcinia cambogia extract with calcium pantothenate (standardized for the content of hydroxycitric acid and pantothenic acid) and extracts of Matricaria chamomilla, Rosa damascena, Lavandula officinalis and Cananga odorata, on body weight in overweight and obese volunteers. B12, Calcium Pantothenate, Nicotinamide /Niacinamide, Folic Acid, Vit. Tenders are invited for Each Tab Cap Contains Vitamin B 12 15 Mcg Plus Biotin Plus Calcium Pantothenate 50 Mg Plus Folic Acid 1. 5mg, Vit-C-50mg, Calcium Pantothenate -1mg, VitD3-200IU, Vit-B2 2 mg, Niacinamide -25mg, Folic Acid-0. 5mg, Vitamin B12 1mcg, Vitamin D3 200IU, Alpha Tocopheryl Acetate 10mg, Vitamin K 10mg, Calcium Pantothenate 5mg, Folic Acid 0.